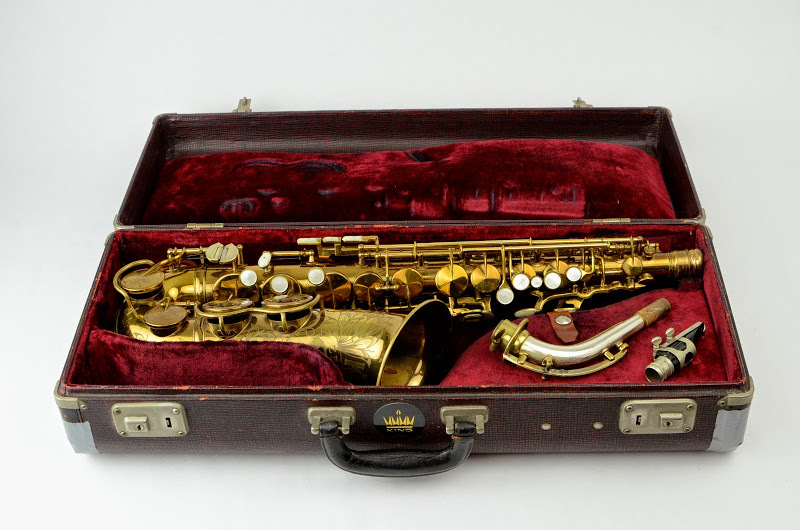 Home / Museum (Sold) / King / King Super 20 Alto Saxophone 298298 Original Fresh Overhaul! <rubs palms vigorously> Well folks, if you want the best, this is the alto you want. It gives you both one of the best altos ever made, and a just-completed high-quality overhaul. The King Super 20 Alto Saxophone with ‘full pearls’ (meaning pearls on side keys, palm keys, octave key, and G# in addition to the usual pearl key touches), is in my opinion the best all around vintage alto saxophone for jazz and lots of other styles. (For tone, I also love early Conn 6M’s!) But the Super 20 wins because it also has solid silver neck, more modern ergonomics, and the full pearls. Tone wise, just go listen to Cannonball Adderley on Somethin’ Else (Dancin’ in the Dark gives you a classic representation of Super 20 alto tone.) Of course, you’ll have to practice a ton to sound as confident and eloquent as Cannonball, but still. If you pair this horn with a Ted Klum New York model alto piece, and use a slightly soft reed for that extra bite, you’ll get fairly close to Cannonball tonally. Meaning, your equipment will not be holding you back from attaining one of the most gorgeous and instantly beautiful alto saxophone tones that has ever existed. It’s also very close in serial to the King that Charlie Parker played (his was 295xxx)! This King Super 20 alto has beautiful original lacquer. It had its original pads before it was overhauled, and was one of those horns you seldom see that is super clean and fresh! Original lacquer. Neck is in excellent condition, with matching serial number. The neck has never been damaged and even still has some of the original gold lacquer on it, which only the most pristine King necks still do. The only past repair is a bit of light dent work on the bow near the low C keyguard, which was done very well. It’s almost invisible. This is among the nicest examples of the Full Pearls King Super 20 alto that I have seen. Comes with the beautiful original King case also!